Welcome to the 2017 Board of Directors Election! 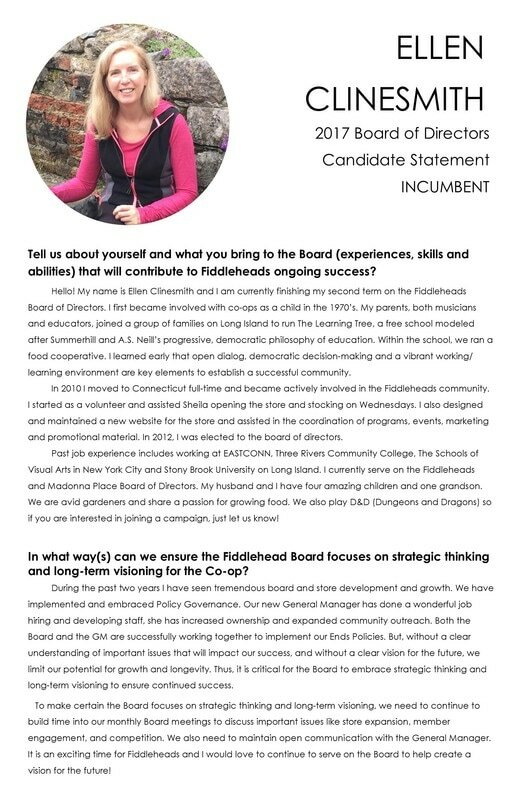 Please download and review the Fiddleheads Election Packet for an FAQ of Election processes, Candidate Statements and more! Election Packets are printed and posted in store as well so you can peruse your candidates over a cup of coffee in the cafe! Welcome to the Board of Directors Election Page! 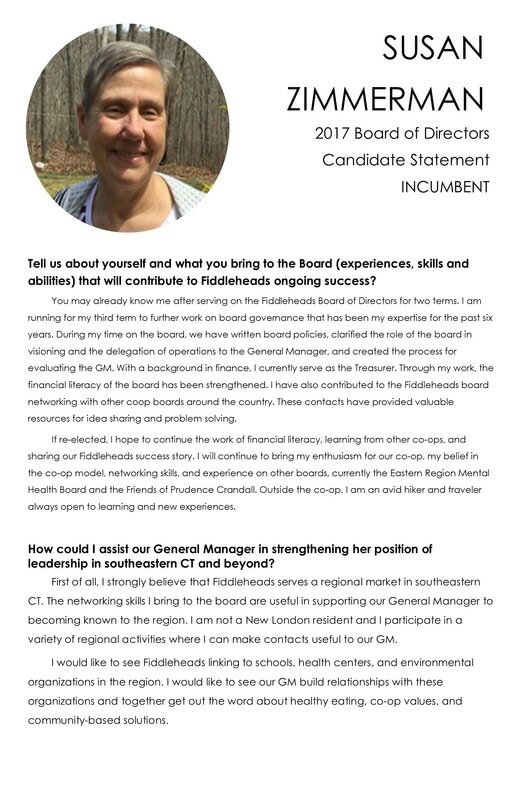 It’s time once again for Fiddleheads Board elections. The Fiddleheads Board is composed of 9 members, and every year we elect 3 owners to serve 3-year terms. It is both a privilege and serious commitment to represent the Fiddleheads owners as a Board Member. 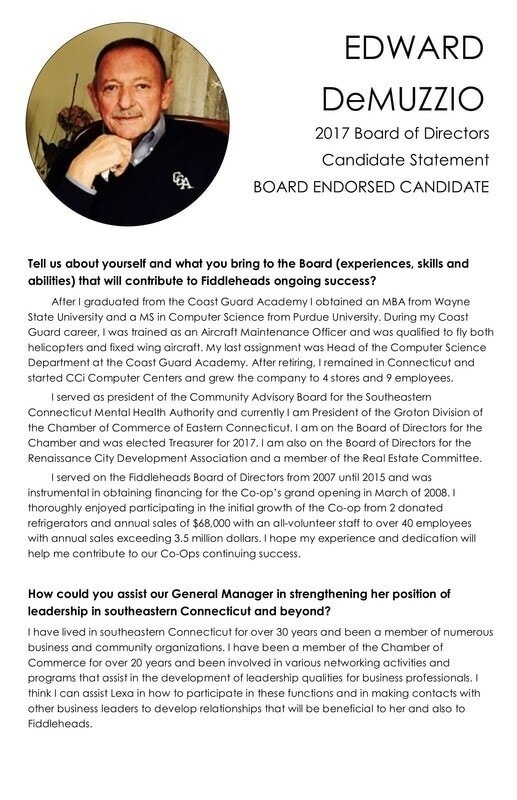 Fiddleheads policy states that any owner in good standing may run for the Board and can have their name placed on the ballot by notifying the Nominations Committee of their intent to run. 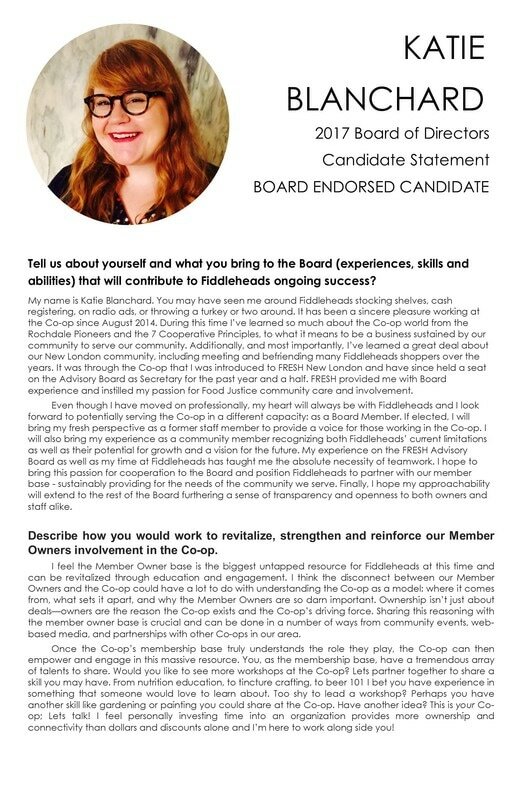 In addition, we have developed a Board Endorsed Process for candidates to use in learning and understanding the essential role and commitment of being a Fiddleheads Board Member. All candidate statements and the election ballot will indicate those candidates who have participated in the process. The Nominations Committee believes the Board Endorsed Process helps candidates understand the commitment required to be a successful Board Member and provides owners additional information important to consider when voting. We encourage all owners interested in running for the Board to attend a board meeting and a Meet and Greet session. The Board meets monthly on the third Tuesday of the month from 6:30PM - 8:30PM. We meet at 105 Huntington Street, New London, CT.
​What does the Board do? We hire and monitor the Fiddleheads General Manager (GM). We set the GM goals (Ends) and the GM runs the day-to-day operations of the store. The GM sets and uses reasonable interpretations to meet the Board’s Ends. 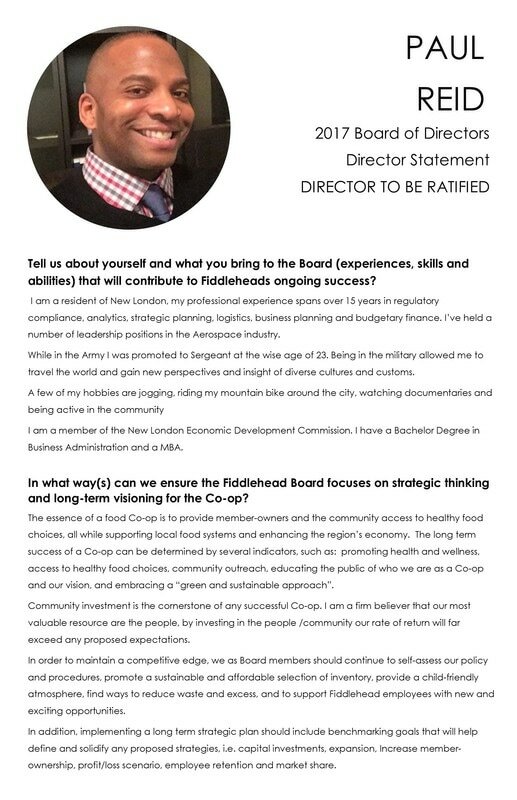 Ultimately, your Board is legally and financially responsible for the success of the Fiddleheads Cooperative. We use Policy Governance to monitor the GM’s operations on a monthly basis. Annually, we sign a Code of Conduct: disclosing personal or business-related conflicts of interest; agreeing to Board confidentiality; speak with one voice and committing to Board preparation and work. We meet each month to review the GM’s performance in achieving the Ends we establish. We follow an annual calendar focus on monitoring Ends and financial reporting. We have no role in the day-to-day operations of the Fiddleheads store. We have no role in supervising store staff. The Board has adopted policy governance to guide us in decision making and developing our ends. Want to learn more? Click Here to read a Policy Governance Quick Guide.